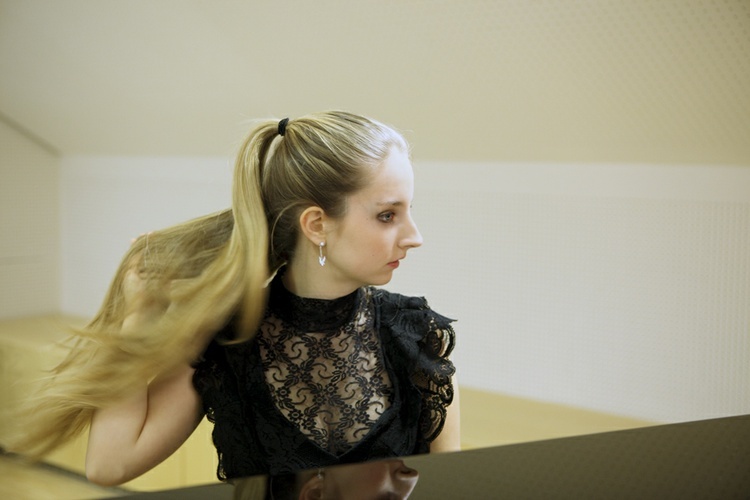 Lise de la Salle, born in 1988, starts playing the piano at the age of four and gives her first concert, broadcasted live by Radio France, when she is nine. Aged 13 she makes her debut with an orchestra with Beethoven`s Concerto No 2. Since 2001 she is pursuing an impressive international career and performing in the major conert halls of Europe, the United States and Asia like the Berliner Philharmonie, the Hollywood Bowl in Los Angeles, the Tokyo Metropolitan Art Space, the Grand National Theater Beijing, the Metropolitan Museum New York, the Concertgebouw Amsterdam, the Tonhalle Zurich, the Palais des Beaux Arts in Brussels, the Herkulessaal in Munich, the Rose Theater Lincoln Center New York, the Auditorium du Louvre Paris, the Grand Auditorium in Lisbon, the Philharmonic Hall in St. Petersburg, the Lincoln Center Washington, the Théâtre des Champs Elysées in Paris, and the Alte Oper Frankfurt. She is working with the conductors James Conlon, Fabio Luisi, Osmö Vanska, Philippe Herreweghe and also under the baton of Sir Charles Mackerras, Mareck Janowski, Semyon Bychkov, Alexander Dmitriev, George Pehlivanian, Lan Shui, James Gaffigan, Ruben Gazarian, Karl-Heinz Steffens, Keith Lockhart and Lawrence Foster. During the season 2010 she appears at venues like the Musikverein in Vienna, the Walt Disney Hall in Los Angeles, the Moscow Conservatory, the Théâtre du Châtelet in Paris, the Boston Symphony Hall, the Mozarteum in Salzburg and the Suntory Hall in Tokyo. Lise de la Salle is regularly invited to perform with the Chicago Symphony Orchestra, the London Philharmonic Orchestra, the Rundfunk Sinfonieorchester Berlin, the Wiener Symphoniker, the Los Angeles Philharmonic Orchestra, the Tokyo Symphony Orchestra, the Moscow State Symphony Orchestra, the Orchestre National de France, the Boston Symphony Orchestra, the WDR Sinfonieorchester Cologne, the Orchestre National de Belgique, the Orchestra Ensemble Kanazawa, the San Fransisco Symphonic Orchestra, the Württembergisches Kammerorchester Heilbronn, the St. Petersburg Symphony Orchestra, the Deutsches Symphonie Orchester Berlin, the Pasadena Symphony Orchestra and the Munich Philharmonic. Her many festival appearances include: Ravinia Festival, La Roque d`Anthéron, Aspen Festival, Bad Kissingen Festival, Enesco Festival in Bucharest, Saint-Denis Festival, Les Folles Journées in Nantes, Tokyo and Warsaw. A first disc dedicated to Ravel and Rachmaninov, unanimously acclaimed by critics, was the beginning of her cooperation with the the record label Naïve Classique in 2002. Her second recording (Bach, Liszt 2004) was honoured with the award “CD OF THE MONTH” by GRAMOPHONE, the most influential magazine of classical music in the world in 2005. Her third album “Concertos No 1” (Shostakovich, Liszt, Prokofiev, released in 2007) with the Gulbenkian Orchestra under the baton of Lawrence Foster received the awards “CD OF THE MONTH” and “EDITOR'S CHOICE” by “GRAMOPHONE” in 2008. Finally a double album, dedicated to Mozart and Prokofiev including a DVD “Lise de la Salle, Majeure!”, directed by Jean-Philippe Perrot, was awarded the “EDITOR´S CHOICE” by “GRAMOPHONE” and the “BBC Music Magazine Choice” by BBC Music Magazine the same year. A new disc dedicated to Chopin marks the year 2010. It features live recordings of the 2nd Concerto with the Staatskapelle Dresden under the baton of Fabio Luisi and the four Ballades. Between 1997 and 2004 Lise de la Salle won numerous competitions (e.g. First Prize in the 2004 Young Concert Artists International Auditions in New York). From 1998 to 2006 she studied with Pascal Némirovski. She also attended the master class of Bruno Rigutto at the Conservatoire Supérieur de Paris – CNSM. For a long time she followed the advice of Geneviève Joy-Dutilleux. Piano concerto No. 9 in E flat Major, KV 271, "Jeunehomme"
Friday evening we could hear Ravel's piano concerto in a full concert hall . Not the one for one hand but the concerto for both hands. Lise de la Salle sounded as though she had three! The young French artist was rather firm at times, and put more emphasis on the rhythm rather than colours. But she also was very alert and ready to play with the orchestra. 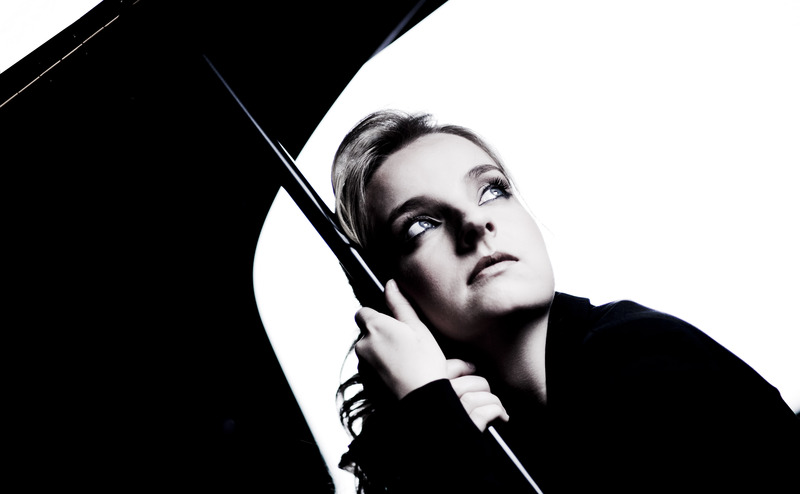 The ash cloud forced Lise de la Salle to cancel her concert in Mogens Dahl Concert Hall, Copenhagen but fortunately a new date was found only a month later. With pale, transparant skin and a deep red dress she entered the podium and hardly acknowledged the audience before she sat down to the piano. Each of the introducing three chords in Beethoven's Sonata no. 26, Op. 81a titled 'Les Adieux' were allowed to sound for what seemed like an eternity. Her feeling for bringing the melodies forward into the light made the sonata intense and alive to listen to. There was constantly a contrast in sound and an intense poetic dwelling which underlined Lise de la Salle's particular musicality. She continued this atmosphere in Beethoven's 'Moonlight Sonata' Op 27, no.2. The dark introduction opened lyrically in tothe hall in a cascade of velveteen colours. Insistingly Lise de la Salle's fingers played the rhythmical motifs in the last fast movement with startling clarity. Schumann's Symphonic Etudes with Variations Op. 13 demand courage, raw strength and incredible surplus - both technically and musically. Lise de la Salle had it all. She unfolded the singing theme with virtuosity and played the following themes brilliantly. With the encore - a beautifully shaped nocturne by Chopin, she quieted the seething hall. Again she impressed with her free and effortless handling of the keyboard. A fine end to a convincing evening. And in this week's cd it sounds as though Liszt's soul has taken up its abode in the young pianist Lise de la Salle. In the best meaning of the word there is something satanic in the way Liszt composes music for the piano. In a piece like Mazeppa, which is about a wild ride over the steppe, he defies the physical limitations of the piano completely. It has to be played with a whetted appetite, and this is exactly what young Lise de la Salle does. Tribute to the idols. Liszt wrote hundreds of piano pieces, but he also had another speciality: to rewrite other composers' music so he could perform it on the piano. This one also hears on Lise de la Salle's cd. She alternates between original pieces and transcriptions like Liszt himself did when he performed, and it gives the cd a brilliant dynamic. A little bit of Mozart's Requiem and a love song by Schubert are portrayed like heroes from the past. The two pieces - Mozart's lovely Serenade for Winds KV375 and Schubert's beloved Trout Quintet were ideally suited for this evening's concert. 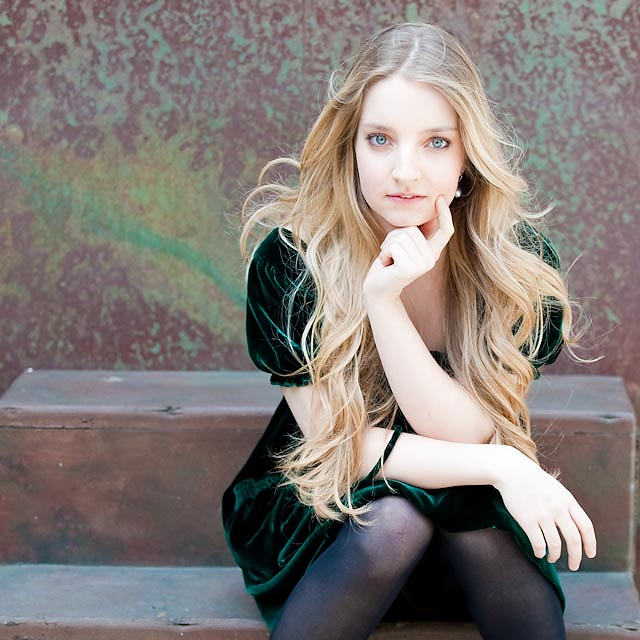 'The slim French pianist Lise de la Salle has in spite of her tender age (early 20's) acquired a lot of experience: recorded cd's and performed concerts with the Vienna Philharmonic and Pittsburgh Symphony Orchestra. Now she was playing Schubert for the first kind in concert - with the Diamond Ensemble. It was a fresh 'Trout' from the serving dish and flipping in the fast movements - but the five musicians expressed the lyrical passages beautifully, particularly the famous movement with variations. Lise de la Salle displayed a formidable technique and a rather hard touch, which could make some of the cords seem a little abrupt. But this was a minor matter during the concert which programme value is well beyond all stars. The Trout is not only a happy and poetic piece of music, it also has tragic undertones of life's perishability and the fleetingness of youth. One was grateful for the beautiful moment this lovely May evening in the Black Diamond Concert Hall.